If you are a real estate agent or broker, you should know that Zillow, Realtor.com, Redfin, and other directory and review sites are trying to put you out of business. It’s a bold statement, but since Zillow started buying houses direct from the owners and selling it a premium, real estate agents who use the platform for lead generation is now facing a fierce competitor, the platform itself. Unless they learn to generate their real estate seller leads, real estate agents will be devoured by the giant beast that is Zillow that they have been feeding for years. Hey guys, Jesse here. I want to make sure you can hear me. I’m doing Facebook lives today, still not quite used to it. It’s a very cool technology. Today I want talk to you about how Zillow and Home Advisor and all of the review sites are trying to put you out of business. I know that’s a crazy bold statement to make, but, I believe it’s true. Today I was just on the Internet, and over the last two years, there’ve been more and more headlines. It’s about the league, for example, Zillow, getting into the real estate game and offering listings. Some people think it’s the death knell; it’s going to be like the end of real estate agents. I don’t think that’s precisely true, but I think that they are trying, and that’s the natural progression of these things. I’ve been saying this for years, Home Advisor, which bought Angie’s list. If you don’t know Home Advisor, you’re probably not in the home services line of work. They’re so big, they bought Angie’ List, which is giant, and Angie’s happy. What they do is they essentially get the consumer to go on and leave reviews and leave comments and rate nothing new there. Then the idea is you think, well, how do they make money? If you’re a consumer, you don’t think about these things. If you’re a business owner, you know exactly how they make money. They come to you and say, would you like to buy leads or would you like to purchase ad space, all of these companies, basically the same business model. But what happens when they begin to get more popular, and they have more inventory of leads? Well now they can begin being more selective, and they can charge higher rates. They become a dominant supplier to you. You have two options. You can join them, or you could avoid it. What most realtors do for, an example of Zillow, a lot of them tried to stay away from it for a while, and some people jump on board and, but eventually, you have no choice because all of the leads are going there. All of the people go there, and now you have to get in line, like in the bread line to get your hand out, and you got to pay your money. Also, then on top of that, what do they do? Well, they sell it to multiple realtors. It’s the same thing with Home Advisor and other several companies. So they’re making money hand over fist on selling the lead numerous times. Is the quality of the lead good? Maybe, maybe not. Often not. With Zillow, pretty decent, but now you’ve got a situation where you’re paying for a supplier to get more potent as time goes on. They had more strength, and you keep paying them money every month you give them a fee. So we’re a whole bunch of other realtors given Zillow fee, they get more and more powerful. They can build out their IT and infrastructure. They can use machine learning, which I’m a big proponent of, which you can do yourself. If your with an agency like ours, by the way, if you’re interested in getting leads and taking back power from these dominant suppliers then click here because you need to get leads first to be effective with your sales strategy, to grow your business. Of course, it all starts with the lead. Second, you want to get to the lead first before your competitors. So it’s getleadsfirst.com. So as you pay them more money, they then become more powerful. Now on top of selling the lead to additional times, then they can say, well, we won’t sell it to other realtors if you buy this territory. Now you’re going to pay a premium. So now you’ve got a situation where you’ve got to pay them even more money if you want to stay on the top of their list. It’s a beautiful strategy. Don’t you wish you were in that business? Well, I have a bone to pick with them. I’m a big proponent of small business. I believe America was based and built on small business and therefore I want to support small business. I feel it’s vital. So my whole mission in my agency is to take back power from these suppliers and give it back to you. Give it back to the small business. I’m a small business owner. I’ve been a small business owner my whole life. I know what it’s like to be in the trenches. I’ve read all the same self-help books you guys have, “How to Win Friends and Influence People” and the Think and Grow Rich books and Zig Ziglar books and yes starting from the trenches and sales and building my way up. I know what that’s like now. I am not a realtor by the way. I did get my license about 15 or 20 years ago, and I never did anything with it. That shows you I probably shouldn’t be one. I’m not trying to take your business; I don’t want your business. We need to band together to create more of our opportunities. 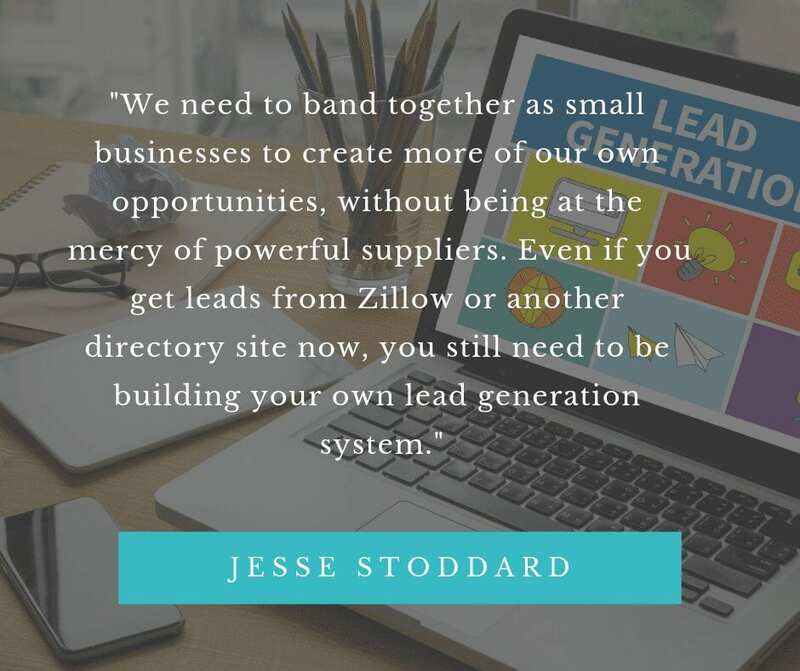 Even if you use Zillow or if you’re a contractor and use a Home Advisor, fine, but always be building your lead generation on top of that. In addition to that and continuously be finding ways to improve your lead generation. So good that you don’t need the Zillows and the Home Advisors of the world. How would you like to do that? If you want help doing that? By the way, go to getleadsfirst.com, and I will show you, we have an in-market targeting program right now. I’m very excited about what we’re doing. We work with a variety of different clients. Everything from my buddy who’s a dentist, has two dental practices, getting him over a hundred leads in the last month and a half. We’ve got a mortgage company that’s just coming on board. I’ll do shout outs for these guys are very cool. However, right now I’m not sure if they want me mentioning them in my videos, but I’ll find out. I should; I do want to, I don’t want everybody calling him either. We’re just getting them, and I’ve got a couple of real estate brokers agents. I think that’s so weird how you used to be brokers and agents make total sense and now they’re all brokers. But now there are managing brokers. You guys live in an amazingly exciting world. Not as bad as mortgage, more regulation there. Zillow for years has to please their shareholders, it was inevitable. They don’t owe anything to the realtors. Although you thought they did. Cause you were a part of what made them work. They could sell you lead and eventually what are they going to do? They’re just going to sell the property and find a way to get that commission. So they want to sell the property, and they’re already experimenting, and it’s only going to expand from there. Now there’s much debate about whether or not they’re ever going to put a realtor out of business. There may always need to be a human being there, possibly, but they’re looking for ways. So that’s the point. Also, by the way, if you have an opinion on this, please comment below. I’d love to hear your opinion, especially if you’re a realtor. It’s not just Zillow though. I mean, Dave Ramsey, cool guy, excellent radio program. I listened to it for a couple of years straight. He gives that referral fee, charges a referral fee and a monthly fee, and also has multiple realtors that they’ll tell about that they’ll advertise a Zillow, Trulia, sync realtor.com, Boomtown. Those are a few of them. If you’ve worked with these, what are the big problems? 1.) The quality is not always there. 2.) It seems like you’re just throwing your money away, which is related to quality. 3.) They’re giving them to other realtors most of the time unless you pay a premium. Sometimes they sell them over and over again, which is annoying when you try to call someone in for other realtors have called them at the same time. It’s ridiculous. It feels like a waste of your time. 4.) You’ve got to continually feed that beast if you want to keep it going and you’re going to need additional help, you got to get all technical. You’ve got to get a CRM system to help follow up the leads. Cause you know, we have a long sales cycle for most of us. If you’re a service-based business, you’re a realtor, and usually, there’s technology, you’ve got to have somebody to call them all the time. So if you’re interested in finding solutions for all of these things, creating your lead generation, and beating a Zillow at their own game. In other words, getting in front of them and getting your ads or your information out in front of them and front of the competitors like Zillow, so that you can get to them sooner and also a way that you may be able to do it, without risk. Also have a system for followup and also have a system for calling. You get the cream of the crop if you’re interested in learning more about how to do that and what we do. Just go to getleadsfirst.com and apply. I’ve got a website up there. I don’t even right now have all of this realtor specific stuff by the way, but this applies to several different business verticals. Contact us, and we have a little application. I have to ask some questions to make sure that we’re a good fit and then I’d be happy to help you. We’ll find out if it’s a good fit or not. If you’re not a realtor this still, we have a lot of different verticals that we could do this in right now though. What’s fancy for the realtors as I can, we can produce seller leads, and that was the other, I think I mentioned four or five. 5.) Typically you get a hodgepodge of leads through these leads programs which haven’t been screened. You don’t even know how they got them half the time. Sometimes you do right where they click a looky-loo, but on top of that, they’re primarily buyers. You know, they’re thinking about buying a home for some home buyers. The market has quite a few options for buyer leads, very few for seller leads, people that want to list. And as you know, as a realtor, that’s the most valuable one because if you take a buyer to a home and they don’t get the deal, then you don’t get paid or they decide not to buy. However, a seller wants the list selling that home, and it doesn’t matter which buyer comes. You get your commission. So I’m trying to focus a little bit more on seller leads, and we’re getting outstanding results. Averages right now, are four listings a month to start. Also, by the way, if you’re interested in that and you want to learn more about it, we do have an application process. I only work with one per zip code. That’s on purpose cause I can’t be working with competitors. We do not sell the leads to anybody else. They are yours to do with, and we build a partnership out of it. I have a no-risk option. There is a refundable deposit for that, but there is a no-risk option where if you don’t feel like our leads are any good and you don’t close any sales, you get your money back, which is unheard of. I don’t think of anybody else in my industry that’s doing that. So if you want to know more about it, go to getleadsfirst.com. Thank you, guys. I hope it’s been somewhat informative today. I guess if I had to boil it down to some main points, it’s this, all of these companies that offer you the lead generation, typical website, you know, software as a service company, SAAS companies, and the review sites and they’re all similar, all wrapped into one. Our businesses profiting off of you and the end consumer in some instances, but mostly from you. So as soon as they get big enough and powerful enough, they’re trying to get rid of you because you are the middle man for them. Also, I hate to say it, but that is the reality of the world we live in. So every month that you’re paying them, you are feeding that beast. Let’s take some power back from them, put it back in your pocket. As a small business owner, let’s build a relationship among small business owners that empowers us because we’re the ones that are making this country one small business at a time. I’m Jesse again. I hope you enjoyed this and if you had one more information on what I do to help real estate brokers and agents, click here.